Summer time in Egypt has finally arrived and with it comes the increased problems and risks of dehydration for the divers. With air temperatures now varying between 34 -43 degrees, do you really know if your body is fully hydrated and ready for a dive? You cant get enough of it! 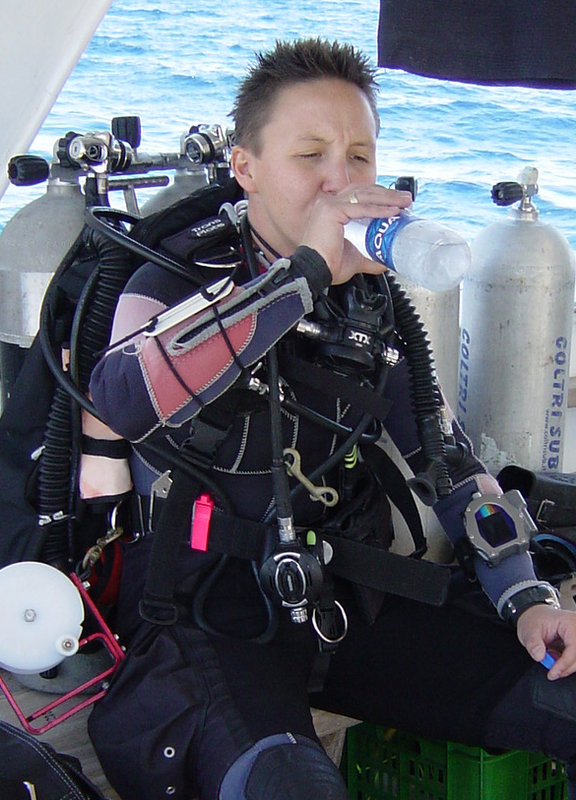 Fluid intake is one of the most important (but neglected) aspects of diving physiology and is something that you, the diver, have full control over. Hydration is one of the major players in the prevention of both DCI and soft tissue injury, so it is in your interest to understand what your body needs to perform to the max. There are few, if any references in the training manuals (entry level, advanced or technical) about fluid regulation and unless you have prior knowledge or a particular interest in fitness many divers remain blissfully ignorant about the importance of being properly watered. So here it is, the complete definitive guide to optimum hydration. Seven tenths doesn’t only apply to the water covering our planet, we have coincidentally the same ratio of fluid in our body. In fact between 69% and 72% of our total body mass comes in the form of fluids. Physiologically we have two types of fluid compartments, intracellular (inside cells) and extracellular (blood plasma, transcellular and interstitial fluid). Much of the water in our body is found in lean muscle mass. Interestingly, nitrogen appears to have a much lower affinity for water saturated tissue than for fat. Fat tissue holds five times more nitrogen than water permeable ‘aqueous’ tissue (such as muscles, ligaments, tendons and connective tissue). We lose fluid through sweat, respiration, urination, diuretic action, stomach upsets and if you are female, menstruation. In sports physiology, sweat loss is considered to be the most important aspect of fluid regulation. This is a factor that can be misunderstood and underestimated by divers. Our body fluid levels are intrinsically linked with our ability to sweat. Sweat is excreted as a result of heat production. Heat is a by product of muscular activity with about 75% of the energy expended during exercise being converted into heat. This extra heat has to be dissipated in order to keep our core body temperature a constant 37 – 38° C. Sweat is produced by some 3½ million sweat glands, when water from our body is carried via our blood capillary network to the skin, where cooling takes place as sweat evaporates. the palms, soles and armpits first. Incidentally, emotional sweat is relied upon in lie detector tests as even the smallest amount of perspiration contains sodium chloride which acts as an electrical conductor and therefore lowers the electric resistance of the skin. Both types of perspiration are important to a diver. A ½ litre of water equates to about 1lb or ½ kg of body weight. It is possible to lose as much as 2lbs (about 1kg) of body weight through sweat in one hour performing normal aerobic type exercise, which in fluid terms amounts to about a litre. During high impact workouts or if you happen to be a person who sweats profusely, as much as 2 litres of sweat per hour can be lost. I hope that when you read these statistics it may bring the reality of dehydration home to you. Even if you think you are drinking enough water, for most of you… drink more! Don’t spend your holiday in the recompression chamber due to something so simple to prevent! The Red Sea under threat! !